Buckfast Abbey pot - 3⅜" (85 mm) high. Mary Gibson-Horrocks fills several spaces in the rich mosaic that describes the the fractal-like influence of the Leach Pottery on twentieth century British ceramics. Born in the stockbroker belt in 1923, she trained at Wimbledon School of Art. On leaving art school she started a pottery in Suffolk that was later occupied by Sam Haile. She worked at Lake's of Truro, and then fulfilled her ambition when in 1944 she was accepted as a student of Bernard Leach. In 1947 she and Michael Cardew were persuaded to form a pottery in Kingswood, Surrey, but the enterprise was short lived and Cardew returned to Wenford Bridge. Mary joined him there in 1949. In 1953 she went to work at Bovey Tracey, Devon, with Alfred Ehlus. This pottery - Lowerdown - was sold in 1955 to David Leach, who still occupies it, and Mary went to Buckfast Abbey Pottery to teach the monks. She remained at Buckfast Abbey, marrying in 1969 when she became Mary Boys-Adams. 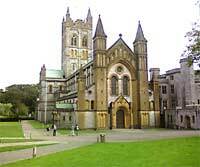 A Benedictine order set up Buckfast Abbey in Devon in early medieval times. After the dissolution of the monasteries in the sixteenth century it became derelict and fell into ruin. In the early twentieth century a French Benedictine order acquired the land and a small number of monks travelled to England to re-establish the order there. Four brothers, only one of which had been trained as a mason, found the original foundations and re-built the abbey using locally quarried stone. The task took twenty-odd years, and the abbey was consecrated in the 1930s. Today it is home to 44 monks and is maintained from the proceeds from the sale of produce - chiefly honey and fortified wine. It is a tourist attraction and welcomes half-a-million visitors a year to enjoy the tranquil atmosphere and beautiful scenery. There are three enclosed gardens, one of which is completely devoted to many cultivars of lavender and very popular with the Buckfast Abbey bees; a strain developed by the brothers for its ability to produce honey and its mild sting. Buckfast Abbey Pottery was established in 1952. It was subsequently run by Mary Gibson-Horrocks (later to become Mary Boys-Adams). 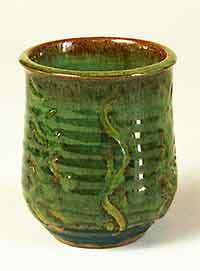 Mary had previously worked at the Leach Pottery and at Wenford Bridge with Michael Cardew. She retired in 2004 and her helper, Brother Alexander, went to Quarr Abbey on the Isle of Wight to set up a pottery. Buckfast Abbey produced decorated stoneware pots.